HEADSPACE W/ CORNELIUS — Salt Water. Only 18 of age, Cornelius Accoh is already charging the biggest swells that hit the Basque Country. We asked him some questions and we were lucky enough to have him answering them after he scored some bombs at Guéthary. Salt Water: Hi Cornelius, thanks for taking the time to reply our questions. For our readers who don't know you can you introduce yourself ? Cornelius Accoh: Hi ! I'm 18 years old, I live in Biarritz, France. I surf since I was 3 in the Basque Country, where I still live today. I started surfing big waves when I was 15, with my friend Clément Roseyro. And today this is my greatest passion. 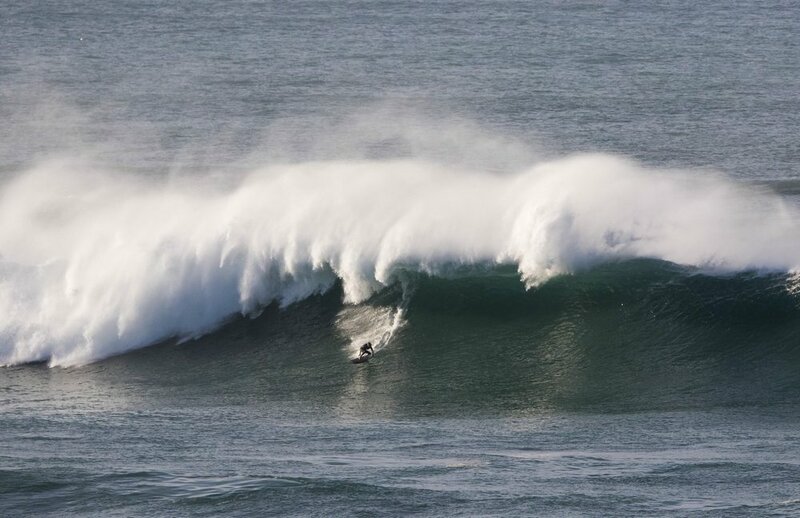 SW: Everytime there is a big swell breaking in the Basque Country you always score. Is big wave riding your main focus ? CA: Yes, it's my main focus. I want to see by myself if surfing big waves can be for everybody, if I can surf the same waves as true big wave surfers, because I considere myself as a lambda surfer. Surfing big waves is the biggest challenge of my life so far, and I love it. Even if sometimes it's hard, due to the trainings I have to do every day. SW: Do you have a specific training / routine to train for big waves? CA: Of course. I do apnea in swimming pool once a week since 3 years now. I stretch myself everyday. I try to surf everyday at least 1h30. I don't exactly know why but I'm convinced that eating a healthy food, not drink and smoke, and sleep well is the most important part of the training to surf big waves. Because with an healthy lifestyle, you gonna be good psychologically, with the impression to be ready for everything that could happen. You can be super strong physically, if your mind doesn't accept to put yourself in a critical place, you can't surf big waves. You need to be prepared to go out of your confort zone. And that's what I'm training for. SW: What is your best memory riding big waves? CA: That was my last session, on the first wave there is in the video. This day was huge. Wasn't the biggest day of my life but it was a good challenge. I started paddling on this wave, thinking it was quite small, and realized there was a big double up, so managed to pass it in making a kind of air drop. And when I finally went at the bottom of that wave, I realized how big it was, and infortunatly get smashed by the foam. I took 3 other waves of this set at the impact zone. But everything went good. So I was really happy. SW: What is your favorite spot in the Basque Country ? CA: Parlementia, definitely. The wave is moving fast, with a lot of water. And if you wipeout, the wave keep you way longer under water then any other wave here in the basque country. It's a kind of sweet Mavericks. But there is a lot of others spots I love. We have the chance to have a lot of different waves here, especially for big waves. SW: Do you have a really bad memory or a big wipeout in mind? CA: No, I've been pretty lucky for the moment. And I always managed to stay calm when I was in a critical spot. SW: Do you think big wave riding is becoming more accessible ? CA: I'm not sure, but I will say no. You can't take out the fear, even with inflatable vests, jet-skis... When you see a wall of water ready to break right on top of you, or you are taking a top to bottom wipeout,nothing can take you out of this situation. This is you, and the ocean. The power of the wave will be here for ever, and the fear that goes with too. SW: What is your objective in the short term? CA: I go to Nazaré today haha, let see what's gonna happen. SW: You also rip on longboard. Do you think it's important to ride every king of shapes? CA: For big waves, I don't think so. You just have to get a good surf level, the shape doesn't really matter. For me, surfing different shapes is more important in general, to be open-minded, try something new, have new feelings and take pleasure discovering new lines. I think surfing different shapes is important to know every part of surfing, something just a few people do, sadly. Yeah, thanks a lot Salt Water magazine. A big thanks to the ones who help me: Chipiron Surfboards, Wetty wetsuits, Mundaka Optic, and Maison du Sud-Ouest. And of course a big thanks to my parents that allowed me to go surfing big waves when I was younger haha.